California High Speed Rail Blog: Where Should a Hanford-Visalia Station Go? This week, the Visalia City Council got a word of encouragement from Bob Schaevitz, project manager for the Fresno-Palmdale stretch of the 800-mile rail line. "This station makes a lot of sense," Schaevitz said. "I've heard nothing negative about the station." But the community should make its voice heard before the environmental impact report is written, he said. There's precedent in speaking up. Two years ago, a coalition of city managers and elected officials from Visalia, Tulare, Corcoran, Kingsburg, Selma and Fowler went to the authority and asked for a station. The group succeeded in getting the authority to change its route maps to include one potential station between Hanford and Visalia, and four more sites around Tulare and Goshen. Now the goal is to get one of the sites changed from "potential" to "designated," Gamboa said. The "million people" figure posited by Mayor Gamboa is open to question, which would be roughly double the current population of the area. Still, 500,000 people is nothing to sneeze at, and if there's a way to build the station without encouraging low-density sprawl, it ought to be examined. Visalia would be a good place for a stop - it has a downtown with some actual density to it and is a larger urban center than Hanford. Unfortunately, Visalia is on the Union Pacific line, and since UP has made it clear they want no part of HSR that would seem to rule out a station east of Highway 99. The CHSRA map seems to preclude an alignment through Hanford, as the BNSF line and therefore the Amtrak California San Joaquin currently uses. That would indicate that a station would be placed on the edge of town, which could provide for some transit oriented development opportunities, but of an inferior quality to those that could be built in an existing urban center. Update:See also this PDF map of the existing SJV rail network and Rafael's detailed look at how this might be upgraded. I'm going to guess that unless the Hanford-Visalia region comes up with the money to build a station, it's not going to happen. And I'm OK with that. Amtrak California would still serve the San Joaquin route and could be timed to coincide with HSR trains at Fresno or Bakersfield, enabling residents of the Hanford-Visalia area to use a connecting service to get to the HSR system. It's not quite as robust a solution as an HSR station, but then, the Hanford-Visalia region has yet to make a strong case as to why they really need to have an HSR station. Show up and let your voice be heard. Visalia station should be in Fresno and Bakersfield, with a Rapid Streetcar system with one end at Fresno station, down one of the western alignments to Visalia, through the center of town on a streetcar lane, then onto one of the eastern alignments to Bakersfield. The word verification is "tramyost" and they call Rapid Streetcars Tram-trains in Europe, so that proves it. OTOH, a stickler might pose the argument that local resident preferences should play a more substantial role in determining what high frequency dedicated corridor local transport system runs between Fresno and Bakersfield than the word verification word that happens to pop up at CAHSR. You used "timed" and "Amtrak" in the same sentence. Agricultural and other freight in the San Joaquin Valley is actually aggregated by SJVR, a subsidiary of RailAmerica. UPRR and/or BNSF then take the products from yards in Fresno and Bakersfield to its final destination. The City of Visalia used to have an electric railroad that provided passenger service from 1906 to 1924. The City of Fresno supports a BNSF alignment down to Fresno but does not believe this precludes a station serving Kings and Tulare counties (i.e. Hanford/Visalia/Tulare area). That preference is based on BNSF's hosting the Amtrak San Joaquins, its willingness to partner with CHSRA and on the superior approach to Thruxton Ave station in Bakersfield. Afaik, Visalia has been pushing much harder for a station and transit-oriented development than Hanford. Concentrating any population growth east of hwy 99 would also be preferable in terms of water supply from the Sierras. Unfortunately, the optimal alignment for HSR would run just west of Armona. An HSR station at the intersection with SJVR tracks there is a marginal proposition because it's quite far from Visalia, Tulare and Porterville. Regional passenger rail service on the SJVR ROW network might make sense, especially if a shortcut from Dinuba south to near Goshen along Rd 80 were added and the old ROW between Richgrove and Hollis brought back into service. 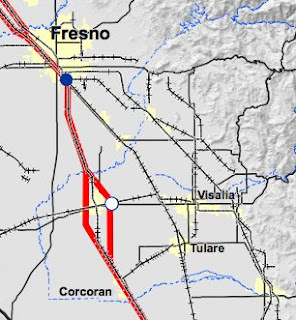 Iff UPRR is amenable to offering trackage rights, that would create the basis for a through line linking a string of towns east of hwy 99, including Visalia and Porterville. The end points would be the Fresno and Bakersfield Amtrak/HSR stations. The model for such service could be SMART in Marin/Sonoma. The question is if Fresno, Tulare and Kern counties could form a similar partnership. However, significantly more money might have to be spent on bypass track sections and sidings for stations as well as freight loading spurs because unlike NWP, SJVR is an active heavy freight service - especially during harvest season. Alternatively, passenger rail service could be suspended at certain times of the year, with temporary bus lines providing alternate transit service. The SJVR tracks might well need investment to secure the speed rating of at least 79mph (preferably 110mph) and maintain it later on. That would mean operating subsidies coming out of county coffers. Grade crossings along the through line would not need to be separated, but FRA quiet zone implementation would be worthwhile. Any new regional rail service in the area between Fresno and Bakersfield should be backed up by local transit which in this context includes networks of bike paths plus discounted folding electric bicycles for customers who purchase annual passes. Transit-oriented developments near stations should focus on high density (mid-to-high rise buildings), self-shading, mutual shading and plumbing for both potable and non-potable recycled water used for fountains and landscaping. Architectural concepts should be borrowed from southern Spain and Morocco, e.g. small windows facing south, deep balconies with side screens and awnings or pergolas, brise-soleil window covers, tile floors, interior courtyards with colonnades and sidewalks in covered arcades. The objective is to avoid exposing interior spaces to direct sunlight in summer so you can avoid running A/C. TOD is important because if people have to get into their cars to get to the nearest station, they're usually just going to keep driving all the way. Weaning this part of the Central Valley off its addiction to cars would be difficult. Culturally, it might be easier to develop algal oil production based on high density vertical bioreactors once gas prices are high enough again. Note that Hanford, Corcoran and Wasco will continue to be served by Amtrak San Joaquin in any case. @ Rafael ... is it possible to sketch on the map in the article which of those alignments is the SJVR alignment? and not irrate any neighbors. I agree, I think they should just build the station on the BNSF route outside of town. If they want to make the investment, create a light rail feeder to service to the station from Visalia downtown. I think the required investment and inconvenience to the rest of the line means that it will be too difficult to set up a station so close to the downtown area. I also was wondering if the route is all BNSF would there even be a need for the current service? The main cities will have HSR and I dont think the tiny towns can support the service.This might be replaced with Amtrak bus service. require the standard service go to free up room. BTW, Rob Dawg, I've ridden the Amtrak California San Joaquin several times, and it's never been off by more than a few minutes. sorry, I don't have authority to edit Robert's posts. A high-resolution PDF version of the SJVR network map is here. A quick-and-dirty map of what I was talking about is here. The preferred route would use BNSF ROW in downtown Fresno, then switch to SJVR ROW through Sanger, Visalia and Porterville. Only the relevant sections of the SJVR network are shown here. However, if UPRR declines to offer useful trackage rights and prioritization, plan B would be to run via Tulare and use BNSF ROW (assuming they are interested in hosting a third passenger railroad service on their ROW between Corcoran and Bakersfield). @ Rafeal ... I didn't mean replace it, but the pdf is even better. It seems the strongest case that could be made for a station to the east of Hanford would be if it was the southern anchor for a local stopping rail service "Hansford HSR" / Hansford / Visalia / Exeter / north to Fresno HSR. But if that is a busy freight corridor, it would need to be a third track system with crossing platforms where needed, so the question arises whether there is space in the ROW (I vaguely recall hearing that question in another context). iff there is an HSR station near Hanford after all, I'd suggest running trains between Lemoore and Porterville on the SJVR network to feed it. Btw, why is there a Navy Air Station smack in the middle of the Central Valley? What I was saying was more like this (I think, I don't post a lot of google MyMaps). Why is there a Naval Air Station? At least small cities in the Central Valley have mayors and city councils that are intelligent and informed enough to want HSR stations. Silicon Valley could learn a lot from them. Congratulations to Visalia for making progress in its effort to get a station. Fresno and Visalia are gateways to Sequoia and Kings N.P. Bakersfield is a gateway to Lake Isabella. Central valley HSR stations will attract riders bound for the mountains. Regarding air bases inland, this dates back to during and before WWII. Air fields were distributed in many locations for national defense and training. Only a few of the air fields remain. Santa Rosa is a business park. Cotati is a shopping district. Livermore is the Lawrence Livermore Lab (?) etc. Assumptions: space in corridor for a light rail track, bi-directional trains. The key bottleneck is ensuring that the rail alignment down the middle of the street in Visulia can be used by the Rapid Light Rail. In support of TOD development, in order to get a local platform, a town, hamlet or suburb would agree to a zoning easement allowing multi-use mixed residential with ground floor professional/retail and four unit stacked townhouse residential within a given radius of the station. OK, commit to that rapid light rail line, and Visulia/Hanford would have a claim to make in favor of a HSR station. "BTW, Rob Dawg, I've ridden the Amtrak California San Joaquin several times, and it's never been off by more than a few minutes." I can second this. Amtrak's on-time problems are mostly connected with their long distance trains. Amtrak's California corridors are generally pretty good. "iff there is an HSR station near Hanford after all, I'd suggest running trains between Lemoore and Porterville on the SJVR network to feed it." OK, on through Exeter to Porterville. And, yes, on the one hand, that would justify a HSR station east of Hansford ... on the other, without the HSR station, there's be no way to justify a line unless it continues on to Fresno. Wow. Looking at the maps of the UPRR and BNSF ROWs down the valley, the UPRR is perfectly straight while BNSF has kinks in it. Is that going to be a problem? Isn't UPRR not going to let HSR run on their ROW? Will the CHSRA have to straighten parts of the BNSF route for 220mph service? And I'm a little confused about what the line does south of Bakersfield to get into LA. Well, one reason that prop 1a contained money to improve existing rail lines is to improve feeder service and the San Joaquin would be a big beneficiary of this to improve service between the valley cities that don't have an hsr station. No need for and additional feeder / rapid streetcar etc, with increased san joaquin services. @ rob dawg Amtrak is doing a very good job in california and in fact its the most successful area outside the NEC. Cali has three of the top performering routes right here in cali. ultimately id say just build the station because the only the local trains will stop there not limiteds or express. well looking at the satellite - I see a rail line that runs along the 99 and right through the interchage of 99 and 198 just west of visalia and east of hanford Id say run it on the line down the 99 and put the stattion at that interchange for easy freeway access from both towns. there's row all the way from fresno along golden state blvd to visalia... is that UP? BNSF? Jim said ..."Well, one reason that prop 1a contained money to improve existing rail lines is to improve feeder service and the San Joaquin would be a big beneficiary of this to improve service between the valley cities that don't have an hsr station. No need for and additional feeder / rapid streetcar etc, with increased San Joaquin services." The SVJR alignment in question is right where you would build it to connect a string of existing towns and hamlets to the main North/South trunk lines ... because of course those towns and hamlets were established along that rail alignment which was built to connect to those trunk alignments. And with a strong enough anchor, that means leveraging TOD opportunities in six or more zones in an area that would under the status quo seem to be almost completely lost to sprawl development. But the San Joaquin is not a strong enough anchor ... hence the dependence of that line on the HSR. That is not to say that the line is feasible, just that its an appealing TOD prospect if it is feasible. Right I get what you mean. Well, i guess we will be lucky to get one train up and running let alone a multitude of new systems. Not to mention, nothing is going to happen that will cause a decrease in ridership for amtrak california, which means maybe 20 or 30 years from now there will be enough ridership to go around. thx for your map, I had misunderstood what you meant. Your alignment would not require new track, just an inconvenient detour past Exeter. If the train/tramyost is fast enough, the locals migh be ok with that. I just suspect that SJVR's freight trains probably don't run all that fast. On the other hand, they probably run often at all except during harvest season. the UPRR alignment along hwy 99 is straight as an arrow but doesn't run through established Amtrak San Joaquin stations. That's because UPRR wants as little as possible to do with passenger traffic - they want the flexibility to dispatch their trains ad hoc, while BNSF is more amenable to operating on a timetable. As for the kinks in the alignment, HSR will have to deviate from the BNSF tracks in some locations to ensure curve radii of several miles. Otherwise, it doesn't much matter that the ROW isn't straight as an arrow. HSR will cross the mountains on brand-new alignments with max 3.5% grade and a series of tunnels (each shorter than 6 miles so no additional service tunnel is required). This applies to the Soledad Valley (Palmdale-Sylmar) as well. agreed, only (some) local HSR trains would stop in the Hanford/Visalia area until there is enough ridership to justify more frequent service. My main concerns regarding an HSR station between Fresno and Bakersfield relate not to real estate values elsewhere in the state but to land use, water management and electricity distribution. We don't want the area to attract a lot of additional residents if that would only lead to higher food prices, demands for pumping more water uphill from the delta and for more electricity generating capacity to run oodles of A/C units. One of the reasons for building HSR is to avoid having to build more runways at airports in the Bay Area and the LA basin. The other is the desire to avoid having to add thousands of lane-miles to the state's highways, especially to hwy 99 and I-5. In other words, the point is to avoid even more expensive upgrades to the state's infrastructure. I suggest that this concept be expanded to water and power distribution as well. If there is indeed strong demand for population growth in arid/desert areas, there have to be solid regional plans not just for TOD but also for urban and building architecture that maximizes shade. Of course, trees provide the most effective shading, but they should be irrigated with recycled water. Most farmers in the southern part of the Central Valley have already installed efficient drip irrigation systems and switched to crops that deliver high value per unit of water consumed, e.g. nuts. There may be some but not a whole lot of additional conservation they can implement to free up water for new residential developments. It's in the Delta that thirsty crops like alfalfa, rice, cotton and pasture are grown. If those are reduced or eliminated, that creates scope for population growth - in the Delta, not down south. There's arguably also scope for population growth along the eastern edge of the Sierras between Sacramento and Redding iff SoCal and the south and east Bay succeed in improving their own water conservation strategies. All through history, people have settled where the water flows naturally - California is very much an exception. Afaik, Libya is the only other country that has built water pipelines hundreds of miles long to support cities. There's been some talk of using tanker ships to transport fresh water from countries that have rivers to those that don't, but it would be hard to deliver the volume needed. As for Lemoore NAS, King's county should anticipate that the Navy will close the base at some point as there are no longer bases in the Bay Area to support. In the interest of crop diversification, the land could be used to grow algal oil in closed loop systems that conserve water, rather than produce more food. The Navy may even be amenable to a gradual transition, since a domestic supply of biodiesel/biokerosene would be a strategic asset. @ Rafael, that was actually in the original sketch a pair of dock platforms at Exeter, with the driver switching cabs to continue, to get the stop closer to the middle of town, as well as to add a cross-over, but with Lemoore / SJV-HSR station / Amtrak Station / Visalia / Porterville, there is no need for the local to continue on to Fresno ... it can be a pure local shuttle. From the perspective of the SJVR, the capacity of single track can be expanded with duplicate passing tracks for the passenger rail vehicles, if the user fee from the passenger rail service is worth the trouble of holding on the mainline before the passing track switch until the passenger train passes through. Since the alignment down the middle of the street in Visalia is a fixed target for light rail stops, the first natural focus for passing tracks would be directly east or west of that road alignment ... perhaps the double bend between Visalia and Ambler, where a duplicate track could be superelevated for higher speed operations than the main line. It would also likely be best to have dedicated passenger track at the system origin/terminus in Porterville. Then it would require modeling freight movements during busy periods to determine whether additional are required. It would of course be easier on freight movements if it is a pure shuttle service anchored on an HSR station. "Right I get what you mean. Well, i guess we will be lucky to get one train up and running let alone a multitude of new systems. Not to mention, nothing is going to happen that will cause a decrease in ridership for amtrak california,"
A local rail shuttle operating basically at right angles to the HSR and San Joaquin alignments expands the ridership base. If an Amtrak station was placed where the Visalia shuttle line crosses the San Joaquin, it would be a recruiter for the San Joaquin as well as for the HSR. So, yes, supporting the HSR with a multitude of little systems should be part of the process. Of course, the multitude of little systems would be on the mustard seed principle ... cast plenty of ideas out there, and see which ones take root. I've never understood why people grow rice in semi-arid areas. Because the federal government differentially subsidizes staple grains at higher levels than other crops and water is not correctly priced. ok, you could have local shuttles but you'd probably also want to provide some level of direct service from Visalia to Fresno. Transfer hurt ridership. Also, if you look closely at the map, you'll see there's a short section on which SJVR runs its trains on UPRR tracks. If you're serious about light rail, i.e. all-new electrified tracks, those would need to be grade separated against both heavy rail and the freeway. That's why I was assuming a heavy rail clean diesel service that could use existing track, adding only a few bypass and shortcut sections. Cp. SMART, NCTD Sprinter. the Delta near Stockton is not semi-arid. @ Rafeal, transfer hurt ridership compared to direct services, but then again duplicating existing capacity costs more than complementing existing capacity. On the trainset, I started out thinking of a Rapid Streetcar when I was looking at streetviews of Visalia in Google maps ... but then I saw the heavy rail alignment down the middle of the street a couple of blocks north of main street, and silently flipped over to a heavy rail trainset. I was already in that frame of mind above when I was discussing duplicated track east of the SVJR alignment in the middle of the street in Visalia and at the line origin at Porterville and terminus at Lemoore. And an appeal to the shuttle is extending the the line to Lemoore ... if it runs to Fresno, then that is Porterville, Visalia, to the Amtrak corridor and then north, quite possible with capacity expansion required on the Amtrak corridor, and duplicating the northern third of the Fresno/Bakersfield route. While each transfer loses some share of the potential patronage (why shuttle transfer to San Joaquin transfer to HSR at Fresno or Bakersfield would be much less effective in support of TOD around the local rail platforms), continuing on to an additional local origin and destination offers to increase patronage. The Delta is still drier than any place in the world that grows rice. The only major rice-growing region in the world that has less than 1000 mm of rain per year is northern India, which gets 600-700; there the monsoon and the river systems are adequate to water the crops. Rice is grown in the Murray-Darling basin, which receives less than 500mm/yr, and in fact in the areas where rice is grown, more like 250mm/year. Well, Australia has the same set of water problems as California. And it's not even a major rice growing region: 90% of the world's rice is grown in East, Southeast, and South Asia. Of the rest, more than half is grown in tropical and subtropical locations in the Americas. And the one-time appeal in the Murray-Darling would be the former availability of water for irrigation, which means that rice farmers are not subject to the vagaries of local rainfall. As the link notes, with water allotments being cut across the board, rice production in the Murray-Darling basin is down 93%. I'm not 100% sure what establishment of a rail line can do to impose a more sustainable water use regime ... however if there is a zoning easement established for, say, 1/4 mile around newly established rail stations, that could well include building standards such as energy efficiency for cooling and separate gray water and sewage discharge lines for buildings taking advantage of the easement. "Lured by the promise of housing that is half the price of L.A. or the Bay Area, hundreds of thousands of people will choose to live here and take the bullet to work and back." Can you believe someone actually wrote that? It's unfortunate that the Union Pacific is so opposed to passenger rail, because the Highway 99 corridor would be a better choice for the San Joaquin than the current route - it might even be a better route for HSR, if you could silence the NIMBYs. Hanford is about half the size of Visalia. Between Visalia and Fresno, you have Goshen, Kingsburg, Selma and Fowler. Not exactly huge towns (Selma is the largest at 23,000), but the population might be enough to support a commuter train. Between Hanford and Fresno: nothing worthy of a train station. North of Fresno you see the same problem: Amtrak has a station called "Turlock-Denair," which would be perfect for Cal State Stanislaus if it were in Turlock, instead of tiny Denair. Guess which railroad goes through Turlock? I don't know if Visalia deserves a high-speed rail station or not. You're definately not going to get one in the downtown area (NIMBY problems galore), but the Visalia Airport area near Hwy. 99 is just now starting to develop and a train station there would give the west end of town a transit-oriented focus point. The proposed "outside Hanford" HSR station is similar to the Visalia Airport idea, but I don't see the same potential for development. You would be building the train station first and then building the neighborhood around it. And Hanford is smaller than Visalia, so your potential ridership would be smaller, even with the existing Amtrak station. I like the idea of an east-west train connecting Hanford/Lemoore with Visalia/Exeter. The trouble is, I don't think the leaders of Tulare County or Kings County have the willpower or the budgets to pull it off. Nor am I certain that the tracks are capable of handling such a train without the sort of upgrades it took to make the Sprinter in Oceanside possible. Does anybody know WHY Union Pacific is so opposed to High Speed Rail? The route is so perfect. I'm so tired of NIMBYs. A highway interchange just outside of Nowhere, CA, and a few miles away from Heardaboutitinanepisodeof24, CA, is NOT a place to stop a High-Speed train! If the NIMBYs don't want all the benefits that an HSR stop would bring to downtown Visalia or Tulare then I say roll right by, it's so not worth the effort to put a stop in by the side of the highway in case somebody wants to drive to the train station.